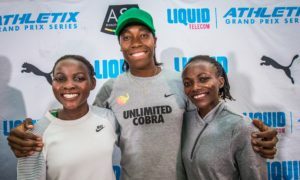 Caster Semenya will face the Ugandan challenge of Winnie Nanyondo and Halimah Nakaayi this coming Thursday, 08 March 2018 at what should be an action-packed second Liquid Telecom Athletix Grand Prix Series Meeting at Tuks Athletics Stadium in the seldom run 1000m. This will be a first for the entire line-up as not one of these athletes has raced in a competitive 1000m. Semenya should start as favourite based on her Personal Best times, however this is a non-standard distance and will affect pace judgement. Nakaayi won the 800m at the first Liquid Telecom Athletix Grand Prix Series Meeting last Thursday (01 March) in Roodepoort, ahead of her countrywoman, Winnie Nanyondo. However, all bets are off as the duo look to take the biggest scalp of their careers. Liquid Telecom is a leading communications services and solutions provider across 13 countries in Eastern, central and Southern Africa that serves carrier, enterprise and retail customers with high-speed, reliable connectivity and digital services.